Plus Size Black Tie Back Rockabilly Gothic Swing Dress  - $63.99 : Mystic Crypt, the most unique, hard to find items at ghoulishly great prices! Plus Size Black Tie Back Rockabilly Gothic Swing Dress. 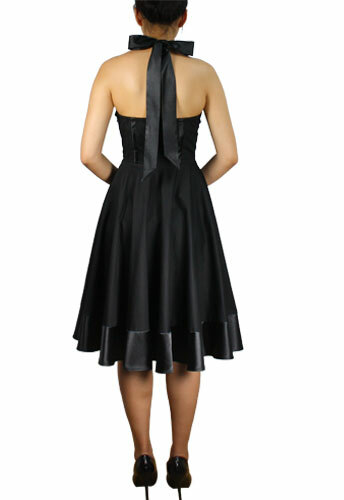 This sleeveless dress has wide ties that form a large bow behind the neck. Satin piping on the front of the bustier and also on the back. 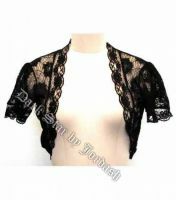 Has a cute split collar and decorative buttons down the front. Side zip. The petticoat is not included. The Halter thick satin ribbon tie allows for the perfect fit! 1X size approx. length: 32 inches; Plus size approx. length: 34 inches. Very flattering for the plus size figure! Trim: Satin 97% Polyester, 3% Spandex. Washing Instructions: Hand wash, Do not Wring, Do not Bleach, Medium Iron, No Tumble Dry, Drip Dry. Find more Plus Size Gothic Clothing, Plus Size Gothic Dresses, and more at Mystic Crypt!